Whatever production companies are doing right here, right now, today, with wireless HD production tools, they want to do right here, right now, today with 4K UHD. That’s great, but common wisdom would share a host of challenges around 4k UHD, not least, the fact that 4K UHD requires 8x the processing power to transmit, then demands additional horsepower (and bandwidth) to accommodate the data and controls, wireless or otherwise, and of course, when you ramp up processing power, you ramp up heat generation, which needs to be efficiently evacuated. Domo Tactical Communications (DTC) has been involved in the manufacture of wireless technology for nearly two decades, starting with SD, moving to HD, and now to wireless 4K UHD transmission mitigating the processing power, horsepower, bandwidth and heat generation issues. This is revolutionary for the Production Industry. We’ve been listening and taken seriously the need to provide remote control of a camera’s colours and iris, particularly for news productions. We have heard from the industry that these are very important factors. In addition, it is clear that broadcast and production companies require a 4K UHD solution that will slip into their current RF architecture in a way that has ultra-low latency as a core requirement of its functionality. This is absolutely key in driving the delivery of wireless content. To address the overall requirements of wireless 4K UHD, our new AEON-TX has adopted a new encoding algorithm called H.265/HEVC, that also includes MPEG-2 and H.264 for other applications. We’ve also provided active cooling within the transmitter to deal with processing power heat, and our dual-pedestal UMVL modulation scheme enables us to transmit higher bitrate content over a wider bandwidth pedestal. But the kicker is the AEON-TX’s ultra-low, sub-100ms latency, which has proven to be the ultimate decider on whether wireless 4K transmitters can be used for certain applications. Then add in the camera control and return data channel capabilities of our AEON-TX package and you will see why it’s deemed revolutionary. The AEON video input supports quad HD-SDI, which can be used as four independent HD camera sources for motorsport where it can provide multiple views from a car or bike. In the transmission of 4K content over RF, we offer the choice of a single DVB-T 8MHz channel, or a dual pedestal mode for greater flexibility. This enables the user to select between the highest possible picture quality or the maximum RF stability. In practice, we have found that it delivers excellent image quality and RF performance. It certainly meets the real requirements of production companies. Thanks to the way in which our H.265/HEVC codec has been engineered and implemented, the AEON-TX is tuned for broadcast requirements with latency under 100ms. This is perfectly manageable in a live broadcast when cutting from fixed, cabled camera positions to wireless camera positions in a multi-camera production. 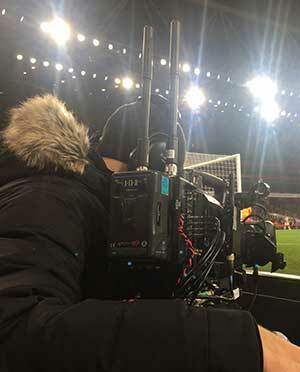 The first live demonstration using the AEON-TX on air was 2 December 2017, at the Emirates Stadium in London, when industry pioneer and major outside broadcast provider Arena TV provided coverage of a Premier League match between Arsenal and Manchester United. The AEON-TX was mounted on the back of a Sony PXW Z450, a native 4K camera. The colour control was managed by Domo Broadcast’s UK distributor VideoSys’s UHF system with the RF set to dual-pedestal mode. “The Domo Broadcast AEON-TX and VideoSys control system worked flawlessly,” said Adam Klink, General Engineering Manager for Arena TV. He added, “Set up and installation is just like a normal RF camera, except it transmits 4K. One of the ways that the system exceeds expectations is that the DVB-T and UMVL RF section was proven to remain stable even under challenging conditions. At Emirates in December, the wireless camera operator was able to follow the players down into the tunnel, under the stadium and through to the reception area without any picture break-up or freezes. With delivery of systems to customers since December 2017, I am confident this is the first operational commercially available 4K UHD system on the market. Through the use of H.265/HEVC, which is a step change in compression efficiency, the DTC AEON-TX delivers a practical solution to the real requirements for live wireless cameras right here, right now, today.